A Friday WHOOSHIE hello to you! I'm showcasing two of my followers today in my Friday DJKASE tributes. I hope they don't mind sharing the spotlight. Here, in my exact words, is the accounting of what happened. Isn't it gorgeous? I knew I had that Memory Box "Small Circle Burst" die and it was NBUS. Then I noticed that the new sketch had been published for one of my favorite challenges called CAS(E) This Sketch. I remembered Cathy's card and I thought I could make a circle burst tree . 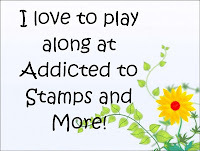 . .
And I knew my card would fit into the CAS theme at Addicted to Stamps and More challenge, sponsored by Deedee's Designs. Then, I happened to visit another follower named Maureen, of Scraps of Life by Scrappy Mo. Maureen has been a lovely friend. She is a doting grandmother who has been blogging since 2011. Her grandchildren also enjoy making cards and it's a treat when Maureen shares their art on her blog! Well, that squinched the deal, didn't it?! Here then is my thank you copyliment for you, Cathy and Scrappy Mo, and I hope you are both pleased! The tree trunk is a snippet of woodgrain paper from GKW. It is glistening with Wink of Stella which I'm guessing is what makes it look coral and not the deep rose color it is IRL. The banner die is also NBUS and I'm sorry to say I can't remember who made it. It came with a set of sport dies, soccer balls, trophies, that sort of thing if that helps with the police lineup. Even the sweet little sediment is NBUS, made by Darice. To make the dotty tree in valentine colors, I cut the circle burst die out of my PTI white card base, and then cut it again in SU pink and primrose. I attached a large piece of double-sided tape to the back of the front on the inside of the outside and then I just popped the dots in the holes, altercating. It may seem tedious, but it took very little time and I had the TV on to entertain me. Besides, with a code in my node and my voice a mere whisper, what else did I have to do? TIPSTER ALERT: That little tool there is a God-send for picking up little paper bits like this and for rhinestones and other assorted bling. It's called a "Quick Stik" and Mr. Google can assist you in finding where you can buy one. It's nifty. Getting back to my witness statement regarding the making of today's card: As I was leaving the Playhouse to go to the Bighouse and get on the computer, I remembered that I didn't make a note of what precise pink SU paper I had used. With my hands full of my card, my die envelope, my outgoing mail, my cell phone, my camera, and with my large glass of wodka tucked in between my armpit and my bozzoom, I stepped back into the Playhouse and bent over to peer in my Pink Paper file cabinet to look at the file folder tabs. As I bent over, I heard a peculiar sound, like rain on the roof. I stood up startled because we haven't had rain here in ages and we are in dreadful need of it. The sun was shining, how could it be rai ~ the cogs fell into place as the hamster dutifully turned the wheel around to where it put two and two together. I looked down at my feet. As the water poured out, it made a raindrop-on-rooftop sound because it was splattering all over my entire collection of Valentine supplies which I had pulled out of storage to be at-hand for timely holiday creations. Here's a close-up. You can see there was quite a pool. Wetted down were lots of ancient schtuff and bits of one-of-a-kind treasures. But these things happen. In true silver-lining fashion, I thought to myself: it's not like I dropped a match on it. I'll assess it all later after it has dried and it's a decent hour to pour myself a wodka, for weals. Not to mention how fortunate I felt that the deluge did not get on my freshly-made card, my camera, or my cell phone, in order of importance. Phew! Well, this post was epic, even for me. It's what happens to a talker when she can't talk and the keyboard becomes her voice. And it clears up the mystery for anyone who might wonder what the heck I do all day. Cough. Oh Darnell - adore the card and am chuckling here, sorry! Hope everything dries out OK! I do hope your throat/voice get better soon, and not because I want to to stop blogging as I love to read your daily shenanigans. Your card is so sweet Darnell. Hope you and your stash are on the mend soon. Thanks for the tip about the Quick Stick, I had heard such a think existed but didn't know what it was called. Suppose if you can't talk you can't sing either - so we must thank heaven (and our ears) for small mercies... and also thank heaven that your water (you sure it wasn't wodka????? LOL) didn't render all your supplies as defunct as your poor voice!! Well Darnell. I REALLY enjoyed reading you post today, so much that I read it twice! Thank you so much for cheering me up, I needed that today! You may be vocally challenged Darnell but you've done a fantastic shout out with the cards that you cased! Love that die, so versatile. At least it was a minor spillage we have floods here! Your card is so much fun Darnell. Love the tree. Sorry about the water mishap. Boy can you tell a story. Happy Friday. How clever you are case-ing these two ladies' wonderful cards and coming up with that creation for the CAS(E) challenge. It's super. I so glad you reminded me I have that Quick Stik. I forgot about it and need to find it. Ugh! So many toys. Sorry about that terrible mishap. Glad you didn't get your phone wet. I stuck mine down is my hubby's Icee one night....all the way. Not good. All turned out o.k. as I put it in a bowl of rice and got all the water out. Wish it could have been rain for you. Fantastic (if a little fussy - wow, what patiences!) way to use that die - love how it looks with the dots all filled in. (Here's a tip - you could (if you sorted them) colour the dots from the white cut out with markers rather than cutting again with different paper.) Great way to really showcase this die! LOVE your CAS card! That magic sticky wand looks like a tool worth plopping down some cash for. Hi Darnell! Love the card. Many chuckles. Wadka does fu..fu..fun makes ya ccccrazy. Oh happy day Darnell it is, what a fabulous CASE and use the sketch for your pretty card! Happy Friday my friend! Love seeing the different ways you all used this die!! Great cards. Hope things dry out soon. If not, it's a good excuse to do a little crafty shopping!! Aww! I love the card, your take on the sketch and the inspiration cards is perfect! I hope you'll be able to use all of your damaged materials. Fantastic card!!! Love it! Lots of little pieces and they're all just perfect in that circle! Ooops on the spill....I did the same thing not long ago and what a mess it creates - not to mention what all it ruined! Card is beautifully CASED...Loved it!!! Love your card and the story that came with it! I can't believe that you put all those tiny dots back in...!!! I am glad that you found a silver lining to your little accident! You are right - it could always be worse! Oh my--what a bummer! However, much of it may be saved & at least you could laugh about it. Your card is so creative & a perfect tribute to those 2 lovely followers! Hope you're over the bug soon, Darnell. 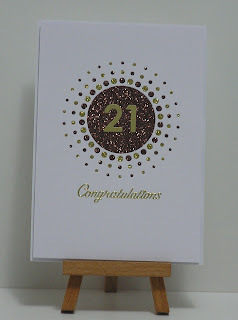 Love the card, fab idea and I have seen those two cards and love the die but it doesn't seem to be available over here. Bummer about the spilled milk - oh I mean water! 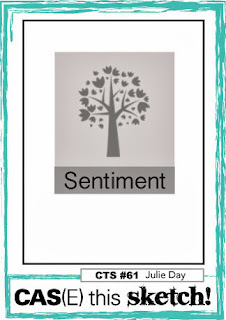 :) - Major bummer -- Love the dotted tree awesome use of the die! Hey there pal! Hope you're feeling a bit better! Perhaps an 8:00am V & OJ is what you really do need to get rid of that nasty cold! Fabulous post...awesome card! Great idea to turn the burst into a tree. Sweet banner die too! Cathy and Maureen are going to be thrilled to bits with your CASE! I admire your patience in replacing the dots! By the way, did you know that "Dot Replacement Therapy"...or DRT as it is commonly referred to in the crafting community, has been proven to reduce stress in middle aged women that like to play with paper & scissors! Yep, read that in a magazine...somewhere! Did you just make a tree with that die?!! Um, brilliant!! And nice work on the detail - I usually find it's always worth it in the end to do the tedious, I mean detail things! As for your rain fall, I'm glad the damage wasn't as bad as it could have been. I blame your bozoom for not holding up her end of the deal...literally! ha ha!! What a great happenstance that two cards to CASE used the same die you hadn't. Turning it into a tree was a great idea, detail dots and all. Oh my gosh!! I love the sun burst valentine tree!! So awesome!!! So sorry your valentine stuff got wet! Hopefully most can be saved!! What a revolting development that was...a line from some distant TV memory...but an amusing tale and a delightful card.Thanks for your concern about my not blogging...I've been committed to cleaning and organizing looking for my lost mojo. Your dotted tree is fabulous, Darnell, and a real tribute to Cathy and Maureen! I love all the texture on the tree trunk and the color combo is beautiful! So sorry you had a spill...I hope the damages are not so bad after you've had a chance to assess! Oh, Darnell, you had quite a day!!! Your card is so beautiful! I can't believe you paper pieced all those dots for your tree!! Wowsa!!! Beautifully combined case of the two inspiration cards Darnell. I think maybe the spilled water will create some "vintage" looking effects on your Valentine elements, right? You always have me in stitches with your stories! Love that die used on these cards. Laughed about your Laurel and Hardy spill. Good story. Hope your stash recovers. As always your post has brightened my morning; you always make me smile! I love this tree - so worth putting in the little dots! Thanks so much for playing along at ASM this week! BTW - it didn't look like too much damage! I always worry about spilling my drink in the craft room! I loved your card and the two inspiration cards. How fun that you take the time to feature your fellow bloggers! Your cards are always lovely BUT your writing gives me great pleasure. First I was in hysterics with your sad story but then I was excited when it sounded like a chance of rain was headed to Southern California. Pray for rain. I blame the hamster for spilling your wodkawater. 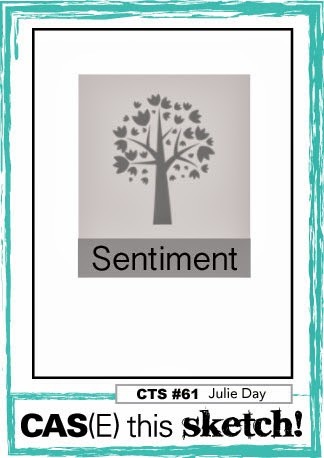 I love how you made a tree from the circle burst die, and it's a great case of both girls' cards. I LOVE your pink and "coral" tree! And that tiny bird is like a bonus! Hope everything dried out OK.
Another show stopper Darnell! This is so fun and so clever and makes the most amazing tree! I love it. Oh noooooo! That looks like a mess to have to clean up! We are always multitasking if we want to craft! Hope not too much is lost! I am honoured that you chose my card to hilight. I love your card. Great idea to put the pieces back in alternating the colours...love that!! Wink of Stella is amazing isn't it...just bought a couple and love the look of it. I think I need to sit back, relax and have a cuppa wodka after reading all that. So.... like it was serendipitous that the two blogs you picked had two cards with the same die and there happened to be a challenge that was made for that die??? I say push the wet VD stuff aside and get thee some lotto tickets!!! BTW, stick to the wodka. I'm having ginger tea. bleh. You are seriously a gem, Darnell! There is no one quite as witty as you. So entertained reading your epic post. You'll have to let us know if anything was salvageable. At least it was on the older stuff, right? Awesome card! Love the alternating colors for your dots. It's a great effect! You are too funny! I love stopping by your blog because it always makes me giggle - I often read your "Darnellisms" to my hubby. Your card is great and thank you for spreading your joy! Oh Darnell...what are you like hunni but believe me hun you are not the only one to have done this because i have too but all over one of my design team cards...aargh!! After a few choice words and counting to 100+...i did calm down and ended up chuckling to myself!! I do hope thou hun you managed to save some of those gorgeous supplies!! Bummer about the darn spilled drink.....rain would have been much better! This die is so cool. Love the tree you made from it. So cute. I so admire your patience. It's a shame about the water spill but notice how clean your stash is now! Your card is lovely and your post was fun to read. I'm so sorry your water spilled all over the supplies you had gotten out:( I hope you were able to salvage most of it. Well, I HOPE you were able to salvage ALL of it! Well I would like to know, who wouldn't be pleased with this beauty!! Gorgeous card there Darnell. I have just come from Mo's and found myself looking on my usual MB stockist for that very die. I have one of them sticky fings though which are known in the scrapbook group I once frequented as a "bogey on a stick"!! I just know you are giggling! Your circle burst tree is GENIUS! The alternating colours, the perfect sentiment and that sweet little birdie! Swoony McSwoon! Thanks for playing along with CAS(E) This Sketch this week! Your story about the water made me so sad for all the crafty stuff that had gotten ruined. I always drink out of a bottle w/ lid in my craft room -- & it has one of those buttons you have to hold in to get the liquid out. Lovely cards, Darnell! Thanks for playing along with CAS(E) This Sketch! What are you like girl !!!!!! I was more disturbed when you said you had spilled your Vodka than I was about your crafting supplies but then you went and owned up and said it was only water. I felt really guilty after that………Phew. What a great case and beautifully done too another perfectly pink treasure. Am off know to found out how you lost your voice. All three cards are really pretty, Darnell. Love the circle die. Lovely cards. Thanks for playing along at CAS(E) this sketch and hope to see you again.